For those of you who don’t know me my name is Sandy and I can be found on both my book blog and art blog. I am a fan of deviantart where I watch several talented artists for updates on their latest work; one artist in particular is Alice X. Zhang whose digital paintings are always filled with a vibrant combination of colours and wonderfully expressive brush strokes. 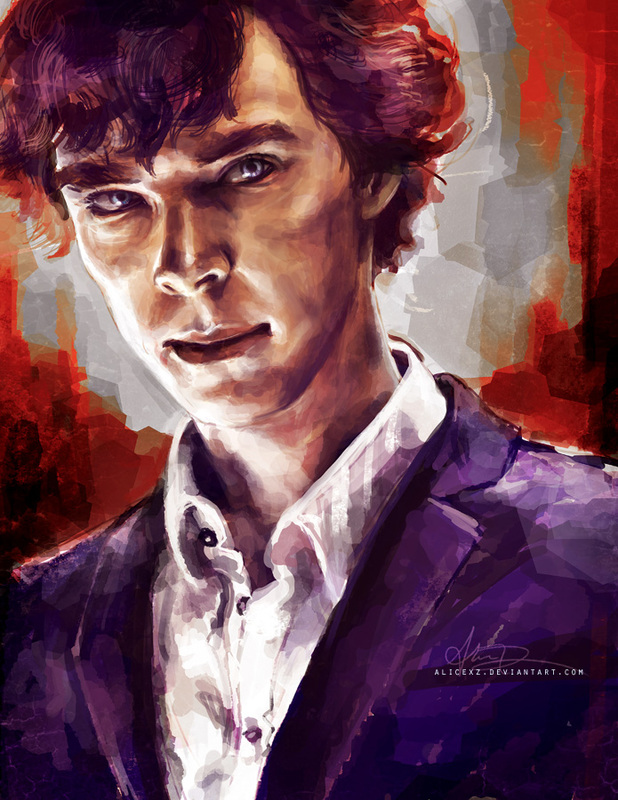 A recent popular subject of Alice’s artwork is the BBC television crime drama Sherlock which I had never heard of before Alice started creating paintings of the show’s characters and recommending them in her Artist's Descriptions. I’ve always been interested in Sherlock Holmes though I’ve never read the novels and of course already being a fan of the BBC I decided to check it out. Now mind you the show was released last year (2010) and I don’t have BBC One on my cable nor was I able to purchase the digital copies from Amazon so I of course resorted to unscrupulous methods of online TV watching and watched the whole season in two days. I regret nothing. 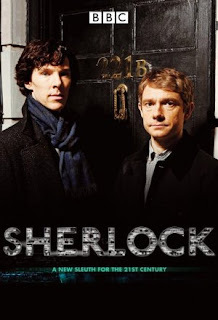 Described as a miniseries, season 1 of Sherlock is a modern day retelling comprised of 3 - 90 minute long episodes titled A Study in Pink, The Blind Banker, and The Great Game. Now after knowing how popular the show was I was surprised that season 1 was only three episodes long and that the fans had been waiting for season 2 for over a year but after watching the first episode I understand now why it's so popular and after watching the final episode I am happy I don’t have to wait long for the new season. This show is not only brilliant and funny, but filled with great characters and is wonderfully written. Steven Moffat became a favourite of mine from Doctor Who and in Sherlock his genius continues to shine through fast paced storylines filled with twists and turns. Benedict Cumberbatch smoothly plays the most parts perceptive genius and some parts ignorant and childish Sherlock Holmes and playing his partner in crime solving and flat mate Dr. John Watson is Martin Freeman who I became a quick fan of in episode 1 or am I fan of John who is both pragmatic and adventure loving? Who knows, either way I love the scenes where Sherlock gets on John’s nerves and is completely oblivious to why John would be upset to finding a severed head in the refrigerator or being called across London to have his phone borrowed. I really do enjoy watching them both as well as the side characters who also add to the show with their excellent acting and of course Andrew Scott's Moriarty who is downright creepy. Sherlock is a show restored for the current century and it is done refreshingly well, and if you haven’t seen the show yet then you should because you are most certainly missing out on great television. It sound very intersting and i hoping it will be as good as the movie. I will check it out and see what happening, with it. One of the best shows...ever!